AND REFERRING TO IT AS YOU PROCEED THROUGH THIS ARTICLE. Whenever we need to make a character assessment, the question arises of how this can best be done. There are several ways to do so. One of these is a method introduced both in the Brummund Rulebook and in the Brummund Technique Book, and following is an elaboration on the method referred to as the Uranian Mandala. One of the premises this method rests on is that the relational points of Aries point, MC, Ascendant, and the Lunar Node are not enumerated as active factors since, as mathematical points, they do not emit energies (in the way that planets do). By means of a systematic survey we should be able to derive a comprehensive character assessment of an individual. Below, to the right, we see a chart of how the planetary energies are categorized, in the format and order used in 1984. In practically every case, a traditional planet is paired with a Transneptunian, with the exceptions of Mercury and Jupiter, which are paired together. In other words, each sector contains two factors. The horizontal rows indicate different levels or degrees of consciousness; these include the 1) Subconscious, 2) Conscious, and 3) Superconscious levels of personal actions and personal reactions to life situations. In the vertical columns A and C we see the polarized fields of Extroversion and Introversion, which are bridged by the factors in column B, entitled Synthesis. It is through Synthesis that new conditions are created from the reciprocal energies of the outer columns. 1.A (MA.ZE): Out of the subconscious arises the preservation instinct, especially when we find ourselves in danger. It is here that Mars goes into action. With Zeus, we react spontaneously in a direction dictated by our compulsions. There is thus little straying or consideration involved. Such impulses underlie animal instincts and strength and are carried out with willpower, in order to save ourselves or survive. The creative side of Zeus may manifest as intuitive artistic creativity. When a sculptor finds himself in front of a stone or a wood block and begins to chisel, he often has a decided concept of what he intends to create. Thus, the artist leaves himself to his subconscious in the creative process. He produces a work that is made with consideration of external effect, grounded in extroverted drives. 1.C (SA.AD): Due to the introverted nature of the basic grounding of Saturn and Admetos, boundaries are set. These can in some cases lead to inhibitions or delays which create problems. 1.B (NE.HA): In the process of synthesizing the just-mentioned polarities, Neptune and Hades can reduce the excesses of the MA.ZE energies, and also soften the hardness and inflexibility of SA and AD. However, if we are functioning at a low level of awareness, we can manipulate ourselves into unpleasant circumstances. Due to lack of energy, or even depravity, we can resign to hopelessness or indulge in self-destructive behavior. More objectively, Neptune and Hades arise from the subconscious metaphysical realm, and both are cloaked in the mysteries of the images in our dreams, which we seek to interpret with our conscious knowledge. This can help us to recognize potential dangers by clarifying and objectifying our deeper feelings and intentions. 2.A (SU.KR): On a conscious level we live daily and hourly and assume this as a foregone conclusion. The Sun, as the source of vitality, lends us the power to fulfill our duties. This is further reinforced by connections with Kronos, which lends self-confidence and openness to the outside world. Self-assurance about our own strength and power should not however, due to overaccentuated extroversion, lead to arrogance. With this sector accentuated, an individual would have a strong animus and tend to be dominant. 2.C (MO.AP): This is the sector of the Animus, symbolized by the Moon and Apollon. A fulfilling emotional life will be experienced through serenity and evenness of temperament. With this sector accentuated, people radiate warmth of heart, peacefulness, and contentment. 2.B (VE.CU): The union of masculine and feminine, willpower and emotion, leads to a love of communion, represented by Venus and Cupido. This sector provides a link between preponderance (SU.KR) and sensitivity (MO.AP), leading to a balance. Venus and Cupido lend the ability to recognize which and how much action is needed, and when emotional commitment is needed to bring about harmony. In both collective life and in love, self-sacrifice is an art by means of which we attain our desires. 3.A (UR.VU): In the philosophical dictionary of Schmidt and Schischkoff we read: "The Superconscious is a subjective and spontaneous, yet remarkably comprehensive understanding which results when objective acts and activities leave strong impressions in our minds that reverberate throughout our spirit and psyche. We thereby have a 'superconscious' awareness of these events". Here we are dealing with ideals or drives in our minds when we make efforts toward personal development and evolution. The tension-laden compulsions of Uranus and Vulkanus are similar in nature to the crackling atmosphere of electrical currents. When seeking to reach an objective unconditionally, we intuitively set all our energy toward emulating a certain ideal. Who among us has not experienced that if we want to attain something or to reach an extraordinary goal, a length of time is often required? Yet we know of friends who have already manifest their objectives. No more delay is needed. Our objectives need to be put into action without hesitation. The immediate plan of action may not be clear, since the motivation comes from the superconscious. In a way, we already have what we desire. These energies drive us to have what we want right now. 3.C (ME.JU): Considering intellect as the polar opposite of activity, we come once again to the Introversion sectors. Positive and constructive thinking, which is represented by Mercury and Jupiter, allows the just and good to prevail. We deliberate, analyze, consider information, and formulate opinions. Inwardly we wait to fulfill our plans when the time is right. 3.B (PL.PO): Pluto and Poseidon indicate a synthesis of planning and execution of objectives based on motives of spiritual essence. The good sense of the intellect coupled with inspiration and the drive to evolve motivate us to strive for further understanding. A: We begin with Extroversion, which is perceptible primarily though our manifest activities at the three levels of consciousness. At the Unconscious level, we react intuitively and create what manifests consciously in certain ways, and this process bolsters our self-reliance. After the required awareness of this, our full power is exerted toward reaching what is needed for attaining what we have long desired. Positive recognition from others is demonstrated when efforts are made with goodwill. C: In the Introversion sectors, unconscious energies manifest in the form of seriousness (SA.AD). This implies a certain heaviness or narrowness of outlook which can sometimes lead to overload or even depressions (SA.AD). For fulfillment of our emotional needs (MO.AP), we need to cultivate positive thinking (ME.JU). Reasonable thinking and beneficial conversations (ME.JU) lead to self-evaluation and, in turn, inner peace and satisfaction (MO.AP). B: In the Synthesis sectors, Neptune and Hades function unconsciously, and if we are to succeed in carrying something out with intuitive perceptiveness, we must become conscious of our inner limitations (NE.HA). Anxieties and self-doubt (NE.HA) can be overcome if we incorporate the spiritual and mystical component of the subconscious (NE.HA). In fuller consciousness (PL.PO), self-esteem comes to us through the harmony (VE.CU) we derive from recognizing and dealing with the more objective realities hiding behind our periodic anxieties (NE.HA); and this in turn leads us to the path of self-realization (PL.PO). We have considered the relationships within the horizontal rows and vertical columns, and now we will look at the diagonal patterns. 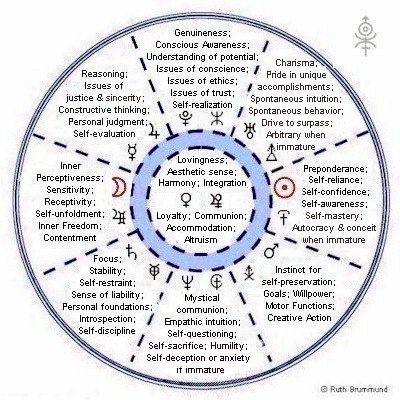 Where the introverted nature of Saturn and Admetos (found in the Subconscious sectors) is emphasized, we might saddle ourselves with self-limitations; whereas the spontaneous reactions of Uranus and Vulkanus in the Superconscious require vigor. In striving for our ideals, Saturn and Admetos might block us, or confine us to pre-defined limits and definitions. Where we might otherwise degenerate into overestimation of our abilities (UR.VU), the humility of Venus and Cupido can be relied upon in order to restore a balanced perspective. The Mars-Zeus combination links subconscious impulses which, when balanced by intelligence and reason (ME.JU), can yield artistic manifestations (VE.CU). The creativity contained within the original developmental potential can manifest, in fact, in any given area. This applies to authors and composers, as well as to painters and research analysts. Any one of them would find it advantageous to apply fairness and truthfulness to help them reach their objectives. The love of communion unites us in carrying out our work with pleasure, and for the common good of everyone. Now we have addressed all the linear relationships between the sectors. There are altogether nine of them included within the whole circle. They are demarcated by dashed lines, indicating that, rather than being sharply separated from each other, the sectors are interrelated, and various combinations of any given factors are possible. The overall circular format should assist us in meditating on the holistic nature of an individual, and to recognize her or his proclivities. It is also important to determine how the individual's shadow functions might manifest and ultimately transform. According to the tenets of C G Jung, those sublimated components of the personality which are not experienced consciously may manifest in unconscious behavior patterns or in antagonism. Thus they can yield both negative and positive results. TRANSLATOR'S NOTE: As Ms Brummund mentioned in another article, the Mandala was inspired by the Astrological Amphora of Louise and Bruno Huber, who worked with Transpersonal psychologist Roberto Assagioli. A concise article on Assagioli's psychology, integrating and even emphasizing the concept of Superconscious/Supraconscious. The Mandala can be drawn automatically on the Special Uranian astrology program by Aureas Software, designed in cooperation with Ruth Brummund. For more information, click here. FURTHER INFORMATION ON INTERPRETING THE MANDALA WILL BE FOUND IN THE FORTHCOMING ENGLISH TRANSLATION OF THE BRUMMUND RULEBOOK. ADDITIONALLY, YOU MAY REFER TO THE ARTICLES LINKED BELOW FOR MORE ABOUT THE URANIAN MANDALA. R Brummund: "Evolution of the Uranian Mandala"